As a full-time mom and part-time blogger, I don't schedule as much time for myself as I should. Mostly, it's because I find it hard to leave Little Dude on his own, and also because I'm a bit of a nerd who would rather design a graphic than my nails! But that's no reason to not look pretty, right? 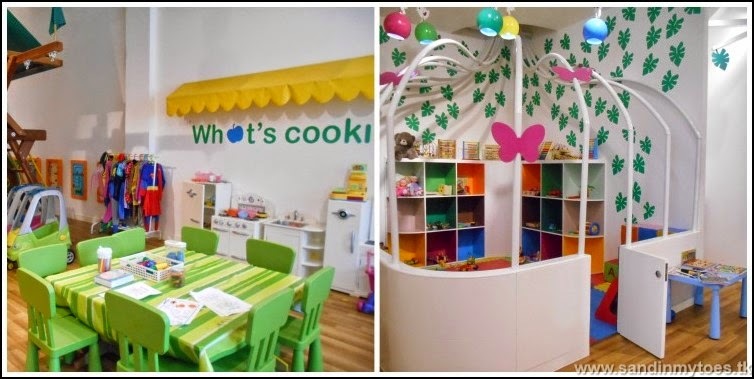 When I first heard about Caboodle, I liked the concept of a play space for kids and a salon for moms under one roof. We tried Caboodle at CityWalk, Dubai one morning and got exactly what their 'pamper and play' concept promises! First off, we checked out the play area. I let Little Dude look around, and asked if he would be okay if I went 'next door' for a while. He seemed happy enough to play on his own, and was supervised by a staff member. There are quite a few things to do, including arts and crafts, and pretend play. They also have screens for video games, but I informed the staff that he wasn't to be given any screen time. They also have a separate section for younger kids, as they take in babies over 18 months. There's also a cafe inside the play area, if parents are staying back. The salon is literally 'next door', just across from the reception. I liked the bright and colourful interiors. It's probably this way since the salon does haircuts for kids, and also some pampering for little girls. I had a mani-pedi done, which was a regular one. The staff were attentive and friendly. Both Daisy and Juliet did a great job at making me feel pampered! Little Dude joined me towards the end of my session, as he was done playing. Not bad, since it was his first time in a play area without me! We both left Caboodle a relaxed and refreshed. I guess it was a welcome break for us! If you're looking for some guilt-free pampering for yourself, Caboodle is the place to be, because your little ones will be taken care of, and within reach. Caboodle offers parents a drop-and-shop service where children from 18 months to 10 years can be dropped off. They charge AED 70 for half an hour for one-on-one supervision, and if you stay along, it's AED 70 for an hour (AED 30 per hour thereafter). A regular manicure in the salon costs AED 70, and a pedicure, AED 85. They also offer many other beauty services such as haircuts and waxing. Visit the Caboodle website for more details, or contact them on 04-3444570 at their CityWalk outlet. They also have a play-only outlet at The Dubai Mall. We were invited to visit Caboodle, but all views and opinions are my own.